The Brooklyn College Center for Computer Music (BC-CCM) is both a place and a community of artists and researchers. Located on the campus of Brooklyn College, one of the senior colleges of the City University of New York (CUNY), and part of the Conservatory of Music of Brooklyn College, the BC-CCM has a rich history dating back to the 1970s. The mission of the BC-CCM is to explore the creative possibilities of technology in relation to the creation of music, sound art, sound design, and multimedia arts. These explorations include composition of new artistic work as well as research on design of hardware and software instruments; auditory cognition; and history, aesthetics and culture of sonic arts. Courses related to the BC-CCM cover techniques of composition with digital tools and instruments, composition of music for visual media, theories and implementation of sound processing and synthesis, design and creation of new digital music and multimedia performance instruments (including software programming and electronic hardware design), audio production, history and aesthetics of experimental music and sound art, and creative collaboration. Interested potential students may e-mail members of the faculty and see online information about classes and degree programs, including our M.F.A. programs in media scoring and sonic arts, as well as our undergraduate minor in music technology. In addition to scholarship and pedagogy, the BC-CCM serves the Brooklyn College community by operating a computer music lab with regularly scheduled hours when classes are in session, providing access for students to learn technological tools, nurture ideas, and develop collaborations. The BC-CCM is home to the biannual International Electroacoustic Music Festival, is part of the Conservatory of Music at Brooklyn College and its Composition Department, Brooklyn College's master's degree program in Performance and Interactive Media Arts (PIMA), the Music Department of the CUNY Graduate Center, and NYCEMF. 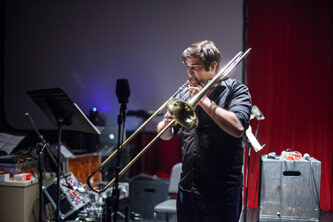 The BC-CCM also sponsors residencies of visiting composers and media creators. For further information about these opportunities, e-mail BC-CCM director Doug Geers. 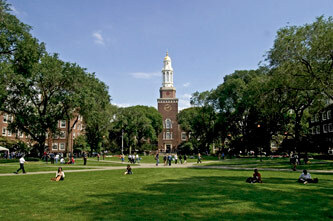 Brooklyn College is located at 2900 Bedford Avenue in the Flatbush section of Brooklyn, New York. The Center for Computer Music is housed in Roosevelt Hall, situated on Bedford Avenue on the West Quad of campus.